The three satellites in Canada's Radarsat Constellation Mission will launch to orbit aboard a SpaceX Falcon 9 rocket in 2018. WASHINGTON — Space Exploration Technologies Corp. (SpaceX) will launch all three satellites for Canada’s planned Radarsat Constellation Mission (RCM) in 2018 aboard a single Falcon 9 rocket, the Hawthorne, Calif., rocket maker announced Tuesday (July 30). The contract award to SpaceX had been expected since January, when the Canadian Space Agency awarded MDA Corp. of Richmond, British Columbia, the 706 million Canadian dollar ($692 million) prime contract to build the RCM satellites. Final terms of SpaceX’s "launch reservation" contact, which was awarded by MDA Corp., were not disclosed. In addition to building the satellites, MDA will market the radar imagery they collect. 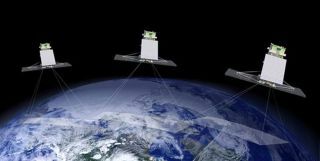 The RCM satellites will collect radar imagery at resolutions as sharp as 3.3 feet (1 meter), enough to discern objects of that size or larger, for a variety of applications that will include Arctic and maritime surveillance and disaster monitoring. SpaceX is expected to launch its first MDA-built satellite, an experimental multimission satellite dubbed Cassiope, this year. That launch will be the first of SpaceX’s Falcon 9 v1.1 upgrade, which features a new engine design and payload fairing and will be used on subsequent missions to launch commercial satellites to geostationary transfer orbit. "SpaceX appreciates MDA’s confidence in our ability to safely and reliably transport their satellites," SpaceX president and chief operating officer Gwynne Shotwell said in a statement Tuesday. "We hope this agreement is the second of many with MDA."